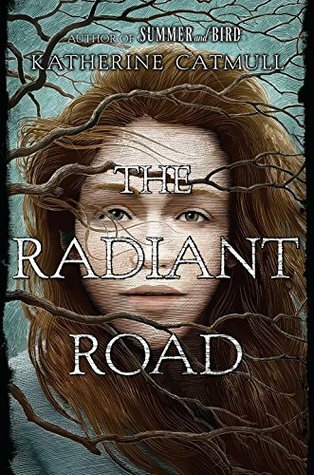 When I first heard about The Radiant Road, the fact that it was set in Ireland immediately interested me. Add to that the mysterious, whimsical sounding nature of the plot, and I was sold! I'm still reading the book at the moment (and it's good! ), but I'm extremely honored to be a part of the official blog tour for The Radiant Road. Please welcome Katherine Catmull to the blog today as she shares her biggest inspirations as a writer! So they asked me to describe my one or two biggest inspirations as a writer and how this contributed to The Radiant Road. By “one or two” you meant “six,” right? kthxbye. 1. Art. The art of Andy Goldsworthy was one of the biggest inspirations for The Radiant Road. If you don’t know his work, go Google it now. Hurry! Some wood pieces by Uruguayan artist Fransisco Matto inspired the ghastly totem used by the villain in The Radiant Road. I love to just cruise through a museum on an afternoon to seeing what makes me go whuh, and then write around it. 2. Science articles and podcasts. Honestly, they are a fantasy writer’s best friend, because you couldn’t make this stuff up. Science has weird metaphor after metaphor, pregnant image after image, ready to hand over to you. A story I heard on RadioLab about masses of fireflies syncing up their flashes (here’s a video https://www.pinterest.com/pin/273875221059685509/ ) inspired an event in the first chapter of The Radiant Road. 3. Dreams, mostly other people’s, sometimes my own. We are such mad poetic geniuses in our dreams, making hard, strange compact images that sometimes soften into seeds, which—with a little care and watering—will beautifully bloom. The Radiant Road was sparked in part by a dream my then-ten-year-old niece told me. Also, one chapter is named after something I saw written in a dream. Dreaming plays a hugely important role in the plot. 4. Old stories and folktales. Folktales are like collective dreams; they have that same curious, impenetrable quality, which is really just their seed-nature waiting to bloom. Not just Irish folktales—like the one about Balor of the Evil Eye—but also Greek myths of the minotaur in the labyrinth: all those made their way into The Radiant Road. 5. Nature, y’all. Writers, get out there! Even if you’re writing a murder mystery set in downtown Brooklyn, go have a long walk alone in the woods. Or walk along a river at sunset, or a beach at sunrise, or in a field at night under stars. The magic of being alone in nature is that it puts you back in your animal self: your body, your instincts, your skin and guts and bone. You understand the world in a much more complex and interesting way when you’re deep in your body. Then take what you learned under the stars, the unnervingly unidentifiable sound a few hundred yards to your left—and put it on the mean streets of Park Slope. Spending time in nature made me understand a lot more about what in The Radiant Road I call our beasts. 6. Everything. That’s the best, when you’re deep in writing and the whole world starts coming at you with handfuls of ideas. In The Radiant Road, there’s a chapter called “The Moon in Her Mouth,” which was inspired by a yoga sequence of that name. I had to rush out after class and write it down. Thank you for the lovely guest post, Katherine! It was tremendously interesting to learn about what inspires you when you're writing, particularly in the context of The Radiant Road. And if you're interested in learning more about the novel, please check out the information I'm including below! And don't forget to visit the rest of the tour stops!